Get up every morning, feeling light and totally focused, highly energized and healthier than you have ever felt before! No pains, no ailments, all sickness and diseases are gone. So get that boundless energy for every moment of the day, with a clear mind and a feeling of inner peace. Possess that best shape that you could ever have in your life: a healthy body, free of any excess weight. These and more are possible with the raw food diet. You can get a continuous supply of your favorite raw food treats and take them to work, or we deliver raw food meals for lunch or dinner without having to prepare it yourself - simply because we are here for you !!! Read more. A one-time 6-hour lecture on 100% Raw Protocol. This package includes relevant topics for the complete understanding of the raw food diet. A combination of lectures and actual recipe preparations ... Read more. This package includes relevant topics for the complete understanding of the raw food diet and how to detoxify the body. Along with a combination of lectures and recipe preparations, the student is closely ... Read more. This is a combination of Package 1 and 2 and is more pronounced with regards to the duration of the program. Moreover, this is particularly designed for certain health situations where a change in lifestyle ... Read more. This package teaches the student in preparing his or her meal with considerations for the liver as a healthy concern. This is also informative on how one should select what is best for his or her health when dining out. Read more. In fairness, napakaganda ng Raw Food Class ni Cheloy. Very educational! You will not only learn how to prepare raw food na supeeeer sarap, and dami pa nyang isi-share na DOs and DONTs sa correct consumption ng tamang food sa everyday lifestyle natin. Mahirap ituro sa iba, noh! I myself, di kaya ng powers ko mai-share sa iba. You've got to attend Cheloy's classes. It's worth your precious time to be a part of her class sharing the healthy way of surviving the NOW generation! 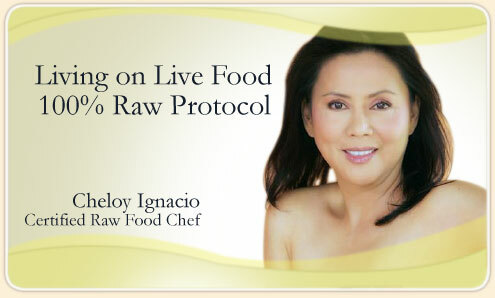 Ang layo na talaga ng narating ni Cheloy when it comes to ALTERNATIVE EATING & HEALING! Hats off ako sa kanya! GO GO GO!!! Rawfood never taste as good as the way you prepare it! Not only is ur presentation exquisite, the dishes themselves reek of health and wellness. Give me more, Cheloy! Cheloy's rawfood taste really delicious and the healthiest food I've ever eaten.